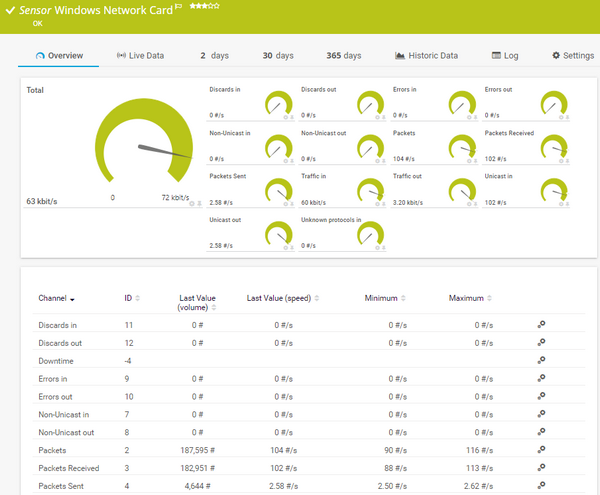 The Windows Network Card sensor monitors bandwidth usage and traffic of a network interface using Windows Management Instrumentation (WMI) or Windows Performance Counters, as configured in the Windows Compatibility Options of the parent device. Requires Windows Server 2008 R2 or Windows 7 or later to be able to monitor 64-bit counters of the class Network Adapter (virtual network interfaces). On older target systems the sensor can only monitor 32-bit counters of the class Network Interface (the physical interface) and will show fewer channels.